Pound for pound, it’s one of the most exciting plays in baseball. Personally, I never had the intestinal fortitude to pull it off in little league, as only the most daring baseball players have executed this play successfully. A straight steal of home is one of the riskiest plays in the game, but there is great reward for the chosen few who decide to tempt fate at the plate. For this week’s Flashback Friday, we look back at Aaron Hill’s straight steal of home from May 29th, 2007. I remember the game as though it were yesterday; the Blue Jays and Yankees were deadlocked in a 1-1 tie in the bottom of the 7th inning. Tensions were running high simply because the Yankees were in town, and games against them always create a playoff-like atmosphere at the Rogers Centre. Below is the very brief replay of the steal of home … and while the play happens in the blink of an eye, there’s a bit of a back story that goes into how the complete events unfolded. It’s almost as though Aaron Hill was destined to steal home, as all the events that lead up to that moment fell into place for the Blue Jays. There was a left-hander on the mound, a runner at third, and what ensued gave Hill a window of opportunity. Royce Clayton fouled a pitch off his foot, and spent a great deal of time outside of the batter’s box shaking off the ill effects. Finally after about 50 seconds in between pitches, Aaron Hill decided that was the perfect opportunity to gun it to home plate. With Jason Phillips standing at first base and Aaron Hill to his back, Andy Pettitte seemingly forgot all about Aaron Hill at third base. Pettitte was truly focused on the man at the plate, Royce Clayton. Perhaps it was that delay in between pitches which threw Pettitte’s timing off and allowed Aaron Hill to gain that fraction of a second head start on Andy Pettitte. Although the video quality is a little grainy, here’s the leadup to the entire play at the plate. Hill slid in safely under the throw by Andy Pettitte, and the tag by Jorge Posada was also high. That run scored gave the Blue Jays the 2-1 lead, and as you could tell by the video, the Rogers Centre absolutely erupted after the play. I think I leap about five feet off my couch, and it looks like the one fan in the Action Seats did the very same thing. 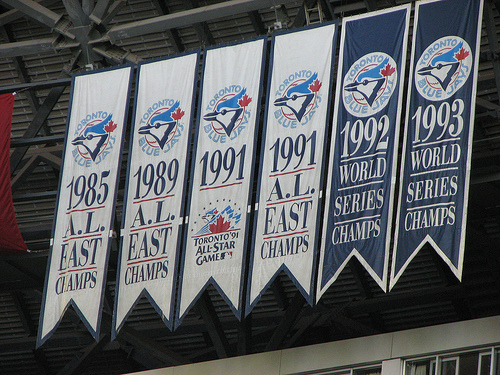 It was as if somebody pumped a shot of adrenaline into the collective bloodstream of Blue Jays fans. 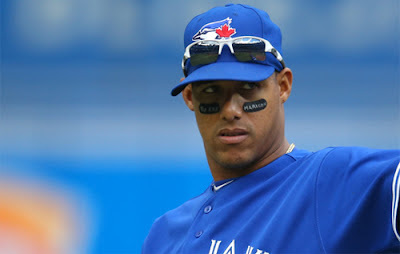 The Yankees ended up getting the run back in the following inning, but the Blue Jays retaliated with another run in the bottom of the 8th which ended up being the eventual winner in a close 3-2 final for Toronto. The most interesting thing about Aaron Hill’s straight steal of home was the play wasn’t decided upon on a whim; the coaching staff had actually put the possibility of a straight steal into the ears of the Blue Jays prior to the series opener. Give credit to Butterfield for having foresight to use that information against the Yankees and expose the weakness by Andy Pettitte. Because it’s not very often that a baserunner can swipe home plate while a pitcher is in the stretch. Surprisingly, Aaron Hill wasn’t the first Blue Jay to successfully pull off a straight steal of home. Raul Mondesi did it six years prior in 2002 against oddly enough … the New York Yankees.